Judy A Goddard, Artisan: Big happenings the world of nature lately! Big happenings the world of nature lately! Big happenings in the world of nature lately! Last week a beautiful (well, kinda) snapping turtle momma came and laid her eggs right by my front door! It's nice to know that critters feel so safe with us! So, sometime between August 6 and September 9, we should have little snapper babies running all over the yard! Then, on Thursday, while driving down a busy road by our home, we noticed cars stopping and swerving off the road. As we got closer, we saw that it was a REALLY big turtle, right there in the middle of the north bound lane! I jumped out and ran over. Tom yelled out the window, "Be careful! It's a snapping turtle!" 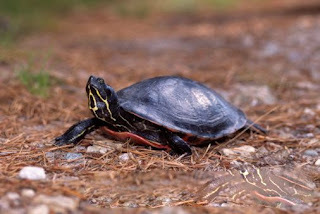 When got to it I saw that it was not a snapper, but a painted turtle, THE SIZE OF A DINNER PLATE! I gently pushed him (or her) off the roadway and we went merrily on our way. Thank you, God, that I got to help one of your creatures! behind my head board. I'm thinking, "Oh great! There's a mouse in my bedroom! But it got really loud and out came this HUGE moth! courageous hubby caught it and put it outside. wing span had to be 5 inches across! house, with out being seen by someone! So far this year has been such a treasure chest of wildlife encounters! I can't wait to see who turns up next!